Languages: English, Spanish, Basque, French, German, Portugish Everiday all over the year. Reservations must be done 48hours in advance. Meeting Point: Pukas Surf Eskola, Avda. Zurriola, 24, San Sebastián. Our schools are supported by the quality brand Pukas, Basque reference and recognized worldwide. Our eskola in San Sebastián, with 900m2 on the Avenida de la Zurriola (oceanfront), is dedicated to customer care and focused on fun and learning. With the largest selection os surfboards of Euskadi, you can surf softboards, high-performance boards, polystyrene surfboards, small and large, bodyboards, and SUPs. 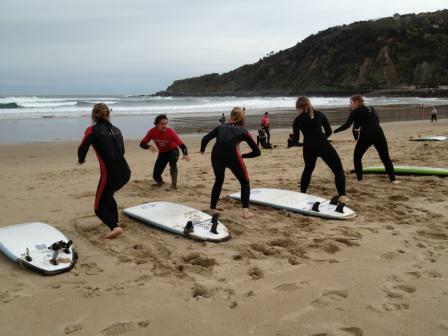 In addition, our team of instructorsis run by prestigious surfers graduated in Sport and Physical Activity Sciences, who besides having international qualifications in the field, they also count with the surfing instructor certification of EHSF (Basque Surfing Federation).